For Rémy Cointreau, the 2016/2017 financial year was marked by a clear acceleration in the Group's Corporate Social Responsibility (CSR) ambitions. Moreover, the brands that joined us during the year (Domaine des Hautes Glaces, Westland Distillery) are leading players in this field that will—five years after Bruichladdich—drive the Group's DNA more deeply into its corporate social responsibility approach. This "CSR impetus" can now be felt across all our teams worldwide: communication related to responsible consumption in the United States and Barbados, Cointreau's One Orange One Tree initiative, the strengthening of our projects within the National Forestry Office in France (ONF) in France, and the implementation of waste sorting at our Parisian headquarters. 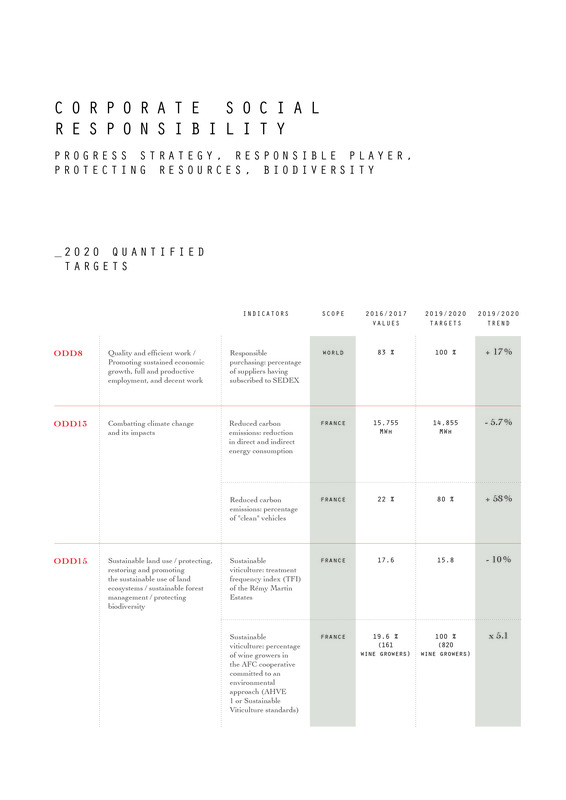 These examples illustrate Rémy Cointreau's ambition to confirm corporate, social and environmental responsibility as a major element in its development. GHG (greenhouse gases) emission control will be underpinned by the measurement of CO2 emissions in accordance with scopes 1, 2 and 3 in an effort to accurately reflect the impact of our activities. Collaboration with our wine-growing partners will be one of the top priorities, bolstered by respect for biodiversity and eco-designed packaging. The roll-out of our SEDEX partnership will structure our relationship with all of our suppliers (including shippers) in compliance with the social objectives we should be adopting. Finally, the Group will continue to implement a consolidated vigilance framework through higher governance (CSR Committee), while ensuring that employees remain motivated (CSR objectives / incentive scheme).